Goals for the garden with an unrivalled two year guarantee * – uPVC Kids Goals from ITSA GOAL are the longest established manufacturer of uPVC goals in the U.K, now in our 25th year of business. We offer you a two year guarantee. You can be assured we will be here to honour the guarantee in two years…… Will other goalpost manufactures ? A cost effective and quality alternative to Far East imports flooding the market, which more often than not end up in land fill sites. In contrast, with spare parts and goal nets that last ITSA goal out performs all other uPVC goalposts. The only uPVC goal with firm fully locking back stanchions that do not pop out when moved which makes this the only uPVC whch is truly fully locking. The Garden Goal is manufactured in 68mm high impact environmentally friendly UV stabilized uPVC tube. The corner brackets are specially strengthened and made in re-enforced polypropylene. Unobtrusive, safe multi-surface anchors are included to firmly secure goal to the playing surface. 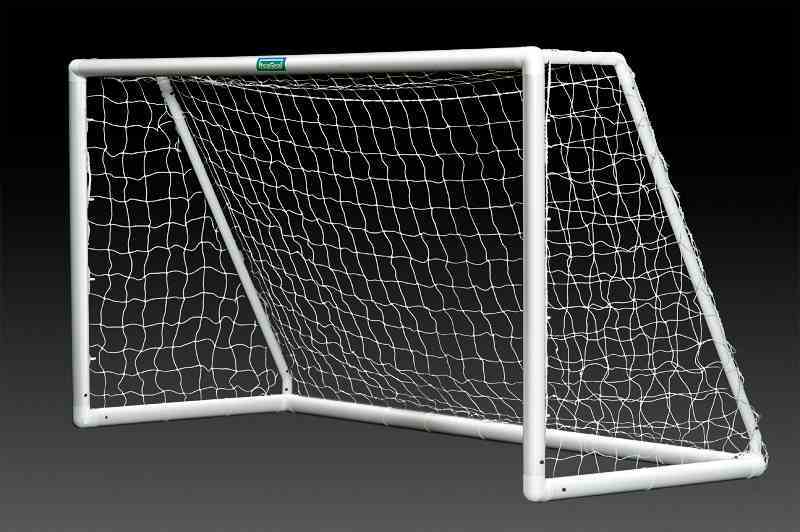 The two section crossbar goalposts will fit in a compact 1.5m goal bag are supplied separately for easy storage. Fully portable – Free standing – Highly flexible – Use on any surface – Virtually maintenance free – Fits in an average sized family car – High impact uPVC – Light and easy to assemble. 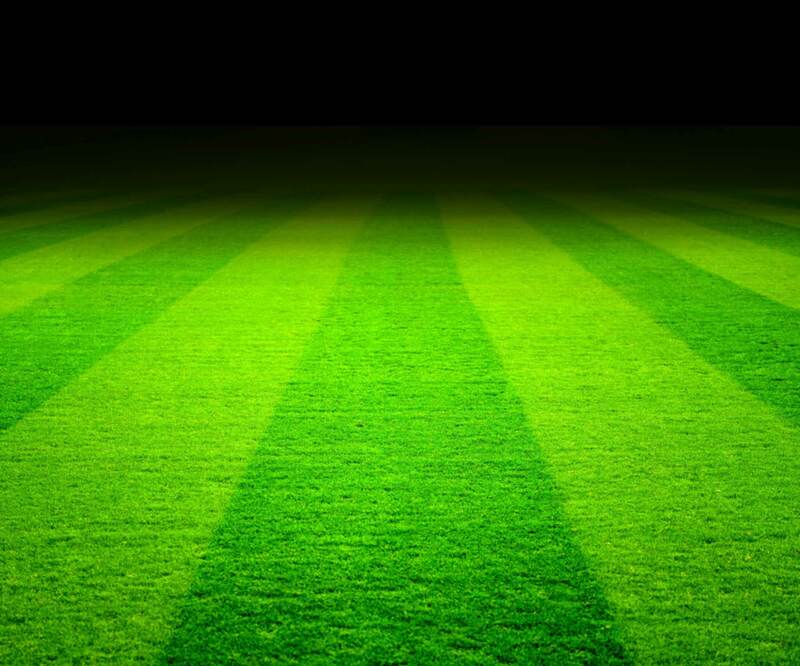 Ideal for the garden or for team training sessions. Strong enough for adult usage. A superior top quality value for money British product Made in Sheffield that is easy to use and the preferred choice of those serious about the game. Conforms to BS 8462 safety standard and exceeds current toy standards, BSEN 741, BSEN 713 and EN 5665. Arrow head net fixings ensure no unsightly nets are pulled around the front of the goal posts. 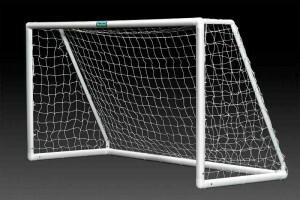 Nets last much longer than on similar football goals and do not fray along the ground as on other uPVC goalposts. Ground frame net fixings shown below save you net from wearing as the nets are clipped along the top of the ground frame post. Length of goalpost run back 103 cm. Extensions available to increase size of goal as children grow. Rust proof ,Weather resistant, Virtually maintenance free.